Looking for a mountain escape, you’ve found it, you’re in for a fun and relaxing vacation. Affordable with a rustic cabin feel this 3 bedroom 2 bath cabin is perfect for honeymooners and family getaways. This cabin is Pet-Friendly. Centrally located to all area attractions. The mountains are waiting to welcome you. Step into an open concept Living, Dining, Kitchen with vaulted ceilings and beautiful stone corner gas fireplace. There are 3 bedrooms, each with a queen bed, one in the loft, one on the main level and one in the terrace level. There is also two full bathrooms in the home. The kitchen has rustic pine cabinets and is fully equipped. Wow, the view from the deck is stunning and has ample seating for fam.The terrace level of the home has been newly renovated with a beautiful rock gas log fireplace, new furnishings and décor, wet bar and a foosball table. Step outside onto the deck where you will find a Hot Tub for some needed relaxation after a day of adventure. 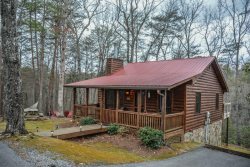 Located just minutes from the quaint mountain towns of Blue Ridge and Ellijay, GA this is a GREAT location for those who want to visit the local antique shops and events happening in the area. The outdoor activities are endless in the north Georgia mountains where Hiking, Kayaking, Tubing, White Water Rafting, Paddle Boarding, Horseback Riding, and Zip-lining are all right at your fingertips. You can also visit the Waterfalls, Hike to a Swinging Bridge, or take a more relaxed approach and enjoy a great meal at one of the many wonderful restaurants or breweries located in downtown Blue Ridge. Don’t forget to take a ride on the Blue Ridge Scenic Railway, be entertained at the Big Foot Museum or step back in time at the local Swan Drive-in Theater. There is something for everyone in the mountains! The last .1 mile is steep, Mountain Laurel recommends a 4 x 4 vehicle.